An investigator for the L.A. County Coroner's Office testified her office found 12 bottles of Propofol in Michael Jackson's home. Elissa Fleak says two bottles were in the bedroom where MJ died, and the other 10 were in a nearby closet. 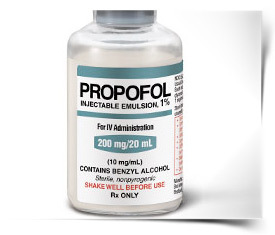 One of the Propofol bottles found in the room by the nightstand was empty. In addition to the Propofol, investigators found a pharmacy full of drugs, including lorazepam, diazepam, temazepam, trazodone, flomax, clonazepam, tizanidine, hydrocodone, lidocaine and benoquin. Also found ... used syringes and needles, as well as a box of unopened hypodermic needles, IV catheters and vials.